Slot Games listed are 7 Lucky Dwarfs from Leander Games. 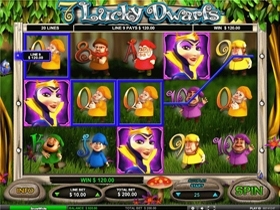 7 Lucky Dwarfs is based on the fairytale of Snow White and The Seven Dwarves and offers 5 reels, 20 pay lines and some interesting features such as a Wild, Scatter, Bonus rounds and Free Spins. Bets range from as little as 0.01 to 10.00 with a maximum win worth 4,000 coins.